We expect Big Data methods to contribute to research with results that are not inferior to those attained in other ways but possibly better, or hard or impossible to generate in other ways. Those who apply these methods may also aspire to augment the arsenal of research methods, offer surrogates for existing research designs, and re-orient research. Moreover, we can critically examine the institutional, societal and political effects of the Big Data methods and the conditions for the solid institutionalization of these methods in social and political research. 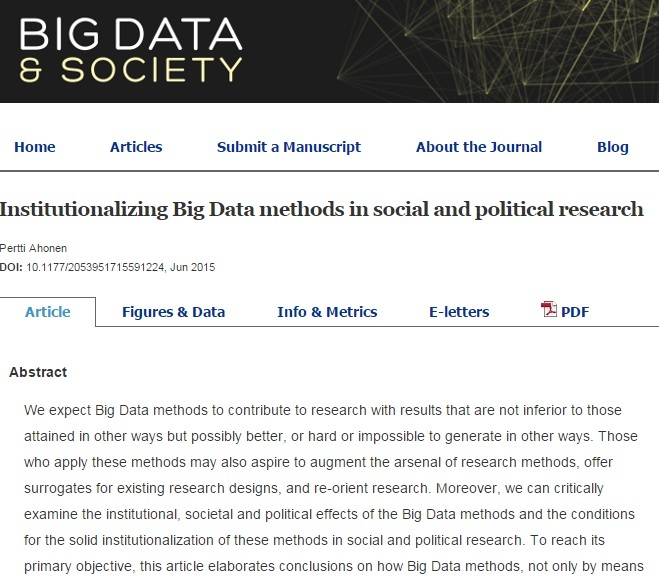 To reach its primary objective, this article elaborates conclusions on how Big Data methods, not only by means of their ‘social life’ but also by their ‘political life’, may influence the institutionalization of social and political research. To reach its secondary objective, the article re-examines a study of budgetary legislation in 13 countries carried out by means of Big Data methods to draw conclusions concerning the augmentation of the arsenal of research methods, the surrogation of existing research designs, and the re-orientation of research.